This pioneering history is a comprehensive account of how Australian Baptists have engaged in global mission. From the early group of women missionaries who came to be known as the five barley loaves, the story has embraced long years of service in the Indian subcontinent and subsequent mission working in other countries. Since World War II, Australian Baptists have worked in Papua New Guinea and East Indonesia and later developed work in Africa, Thailand and beyond. Written by mostly former Global Interaction staff, this is an inspiring and scholarly account of a significant Australian mission agency. 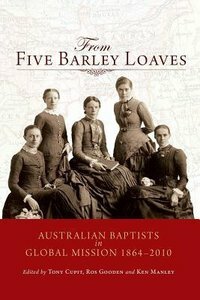 About "From Five Barley Loaves: Australian Baptists in Global Mission 1864-2010"